With an Apple iPhone device, iTunes plays a great role in carrying out numerous tasks. So, it can be extremely frustrating whenever you detect that your phone won’t connect to iTunes, especially when your iPhone is locked with passcode and you need to unlock your iPhone. Here is a guide to finding a lasting solution to this problem – iPhone locked with passcode cannot connect to iTunes. Part 1: Why Won’t My iPhone Connect to iTunes? Why Won’t My iPhone Connect to iTunes? 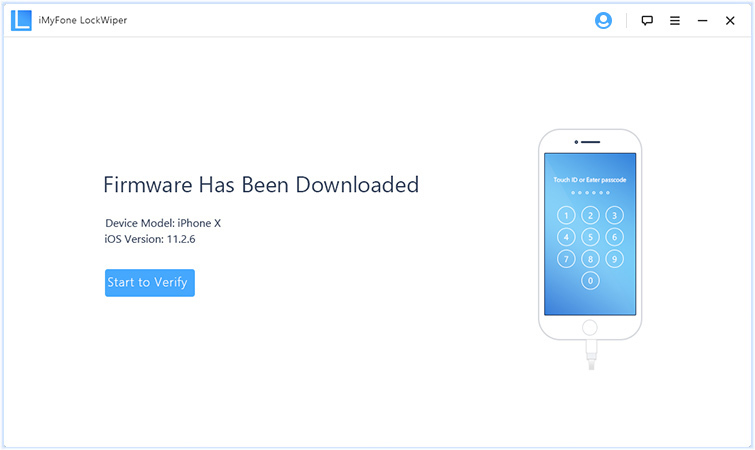 If you have been receiving the error message “iPhone is disabled, connect to iTunes”, you have been locked out of your iPhone. This occurs when an incorrect password has been entered through several attempts. Then you need to unlock your iPhone so you can reuse it again. 1. You have been locked out of iTunes due to several incorrect login attempts. 2. You are connecting your iPhone to iTunes for the first time. 3. Something else is wrong with iTunes if you have already synced with it in the past. Don’t worry, you can still unlock your iPhone in minutes even your iPhone locked with passcode cannot connect to iTunes. Please keep reading. If you have come across the problem like iPhone locked with passcode cannot connect to iTunes, forget about iTunes, forgot iPhone iCloud account password, you can solve this problem in an easier way. Here comes iMyFone LockWiper, which can help you solve all kinds of iPhone lock screen problems. It’s the best solution to unlock your iPhone without any hassles. 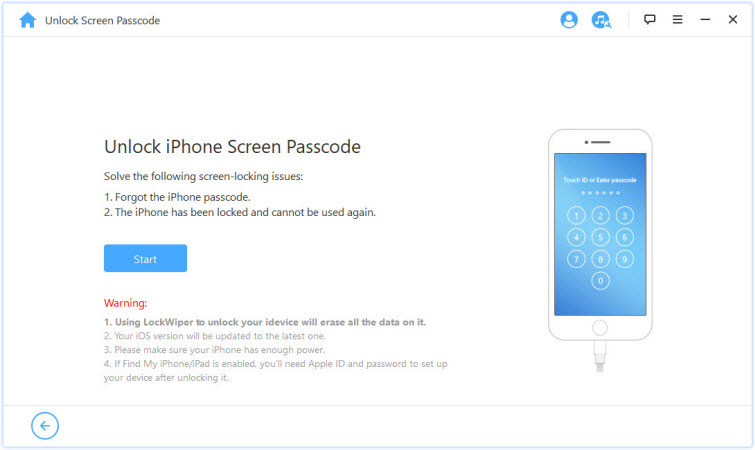 With iMyFone Lockwiper, you can easily unlock your disabled iPhone without passcode. The most recommended way to unlock Apple ID and remove iCloud account. The tool can easily access any form of locked, disabled or even a broken iPhone screen. It is designed to support the unlock of any iPhone device lock screen passcode either it 4-digits, 6-digits, face ID or even touch ID. It’s compatible with even the latest iOS 12 and the new iPhone Xs/Xs Max/XR. Step 1: Download iMyFone LockWiper and open software on your computer. Then, click on “Start”. 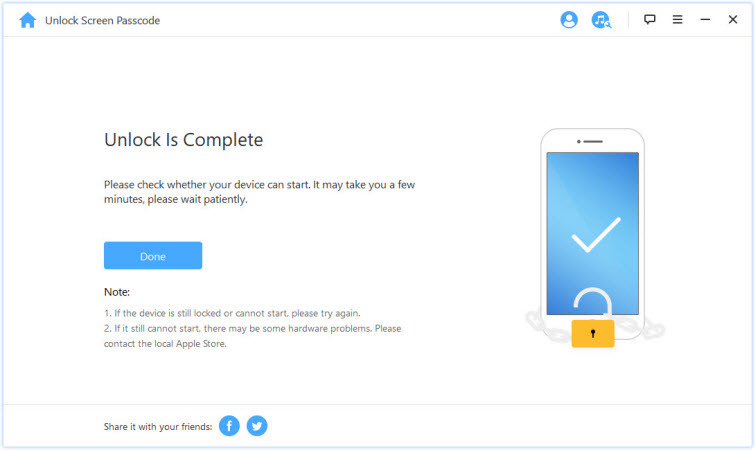 Step 2: Connect your iOS device together with your computer. 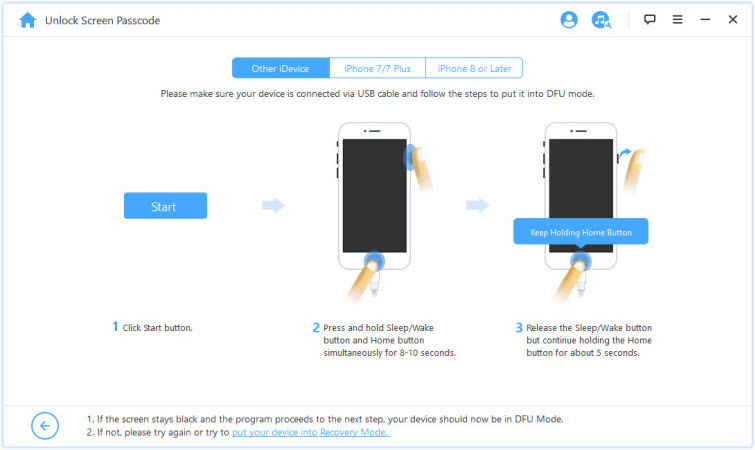 Boot your iPhone device into DFU mode or Recovery mode. 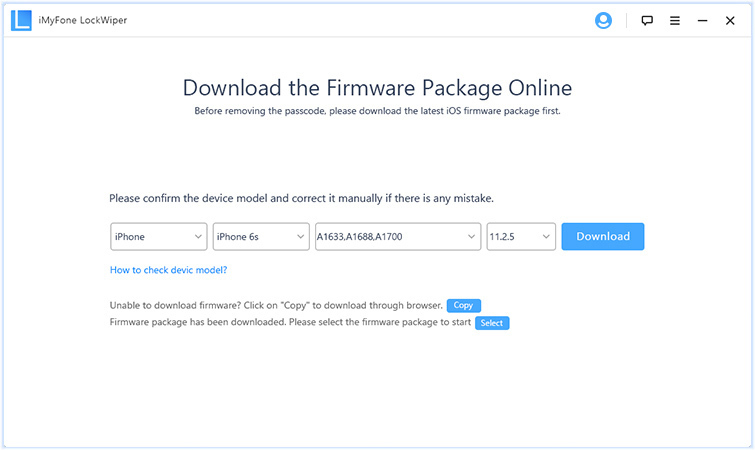 Step 3: Click “Download” icon to download any necessary firmware package online. Step 4: Once downloaded, click “Start to Verify”. 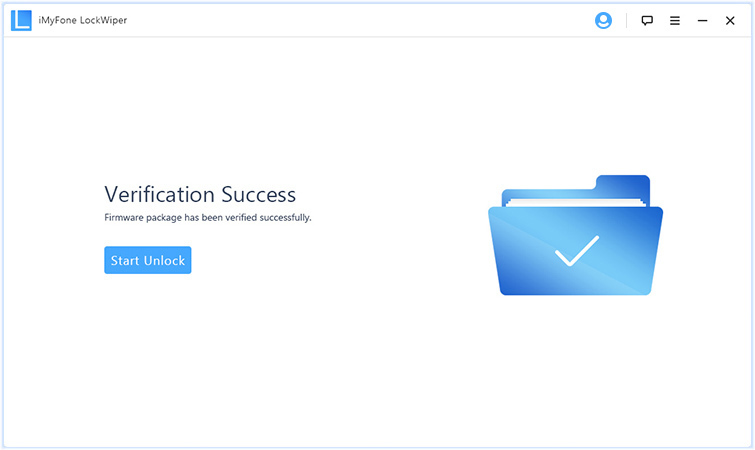 Step 5: Once through with the verification, click on “Start Unlock”. This will instantly unlock your iPhone. Step 6: When you are through with the whole process, your disabled iPhone will be successfully unlocked. Note: After it removes your iPhone passcode, it will also erase everything on your phone and update your iOS version to the latest one. When you forget the password to your phone and you’re locked out of iTunes, the other alternative to connect your iPhone to iTunes is using iCloud. Unfortunately, if your phone isn’t backed up prior to this, using the iCloud method of password recovery may lose all your data. 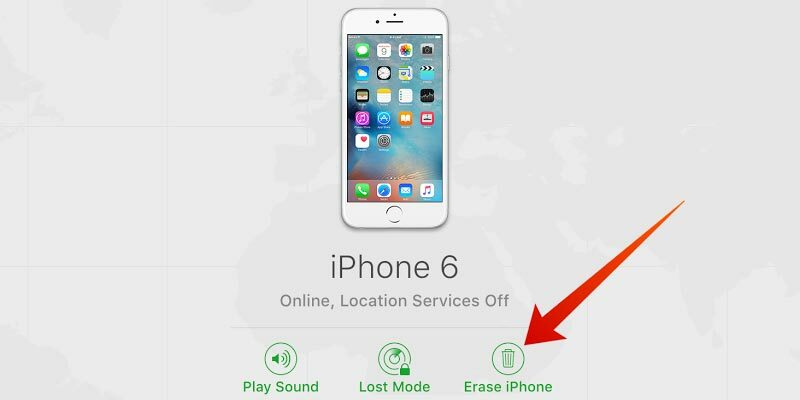 Additionally, before you can use iCloud to restart your device, you will be required to have the “Find My iPhone” turned on. Step 1: Open icloud.com from a browser using another device or computer and sign in. Step 2: At the top of the browser, click “All Devices”. Step 3: Select your iPhone from the array of listed devices. Click “Erase iPhone”. Step 4: Follow the instructions of the Setup Assistant to restore your recent iPhone backup if you have one. In conclusion, you do not need to be scared if you are having issues connecting your iPhone devices to iTunes. The above guides are enough the possible solutions to that. To fix this, iMyFone LockWiper and iCloud tools works better. If you want to fix it quickly and safely, iMyFone Lockwiper may be your best option. Getting Message “iPhone Locked Connect To iTunes”? Let’s Fix It Out! If You Forgot iPhone Lock Code, Here Is How to Recover It!